Toenail psoriasis (Psoriatic Nail) generally occurs in conjunction with some other form of psoriasis that visibly affects some portion of the skin. Toenail fungus is probably the most common cause for toenail problems, and thus many sufferers often mistake toenail psoriasis for this conditions. For this reason, it is imperative to have a professional take a look at the infected toenail so that a proper diagnosis can be made. In most cases, the specialist will be able to immediately identify the problem as toenail psoriasis during a physical examination. This is due mainly to the fact that the symptoms in the toenails will be accompanied by scaly, swollen, and reddish lesions on some other part of the body. However, if this is not the case, the foot specialist will have to pay special attention to the appearance of the toenails. The foot specialist will take into account the colour of the nail, any particular patterning, and whether there is any separation from the nail bed. Psoriasis generally manifests itself in the nails by turning them a distinct shade of yellow. Another typical indicator of toenail psoriasis is called pitting, in which the nail bed will appear to be littered with tiny holes or pits. The pits are often coupled with the presence of white horizontal lines across the nail bed. Probably the most painful symptom of toenail psoriasis is the separation of the toenail from the nail bed; this happens in onycholysis and in subungual hyperkeratosis. During onycholysis, gaps are formed as the toenail detaches from the nail bed allowing, bacteria the opportunity to get in between the toenail and the nail bed, often causing dark areas of infection to appear. 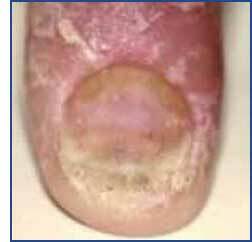 In subungual hyperkeratosis, the toenail gradually lifts away from the nail bed. In this case, a chalky substance is visible under the toenail.